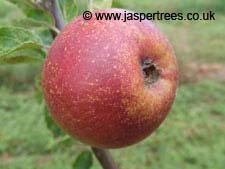 Important Note - I have put dates by my images wherever possible but please bear in mind, ripening time varies across the country and year to year on the same tree (Image shows the difference between sunny to shady side on this 2yr tree). LC. 1857. 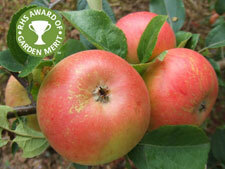 A hardy variety suitable for all areas. 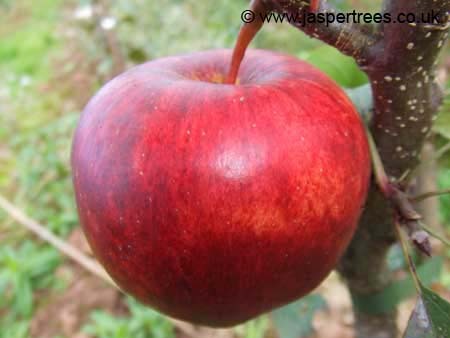 Handsome apples follow fine blossom. 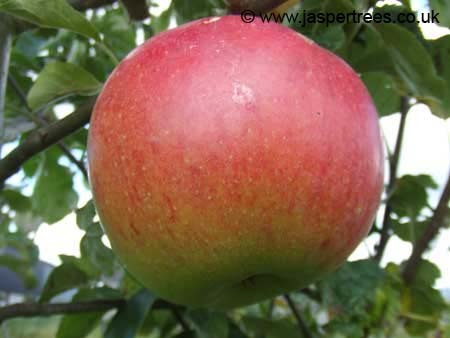 Long keeping apple from December till May. Image 'Annie Elizabeth' 4th October. EC. 1912. Self fertile. 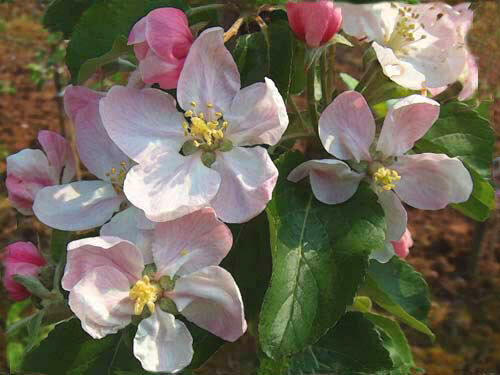 Has beautiful blossom. 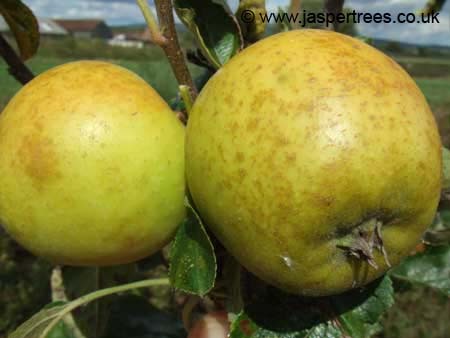 Very large greenish yellow fruits flushed with light brown. Use August to October. Image 'Arthur Turner' 10th October. AGM. MD. Late 1500's. 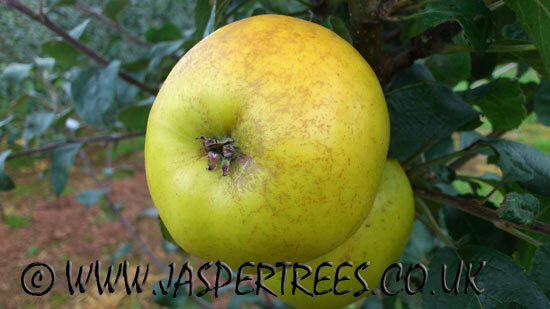 Identical to Herefordshire Pearmain. 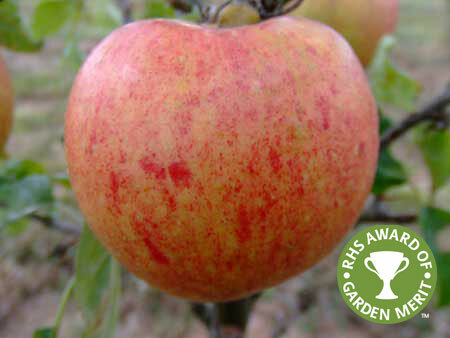 A pretty flushed and russeted apple with a quite rich taste. Ready late September. Image 'Autumn Pearmain' 6th September. ED. 1864. Very early variety. 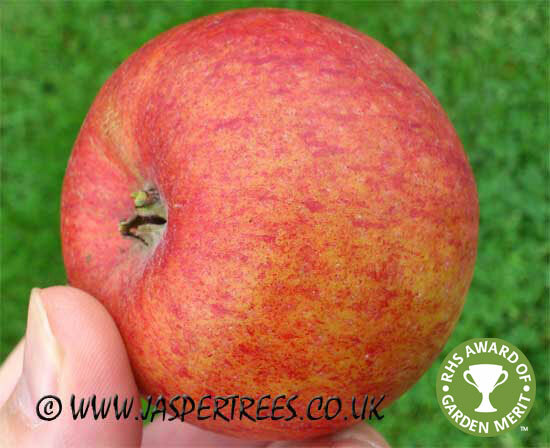 Soft juicy and sweet with distinct acid flavour. Use in early August. Image 'Beauty of Bath' 3rd August. LD. Refreshing crisp taste, can be perfumed. 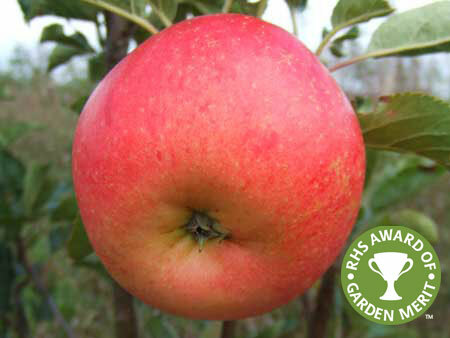 Often requested as its the best supermarket variety but plant in a sheltered sunny position, needs good sunshine to ripen. 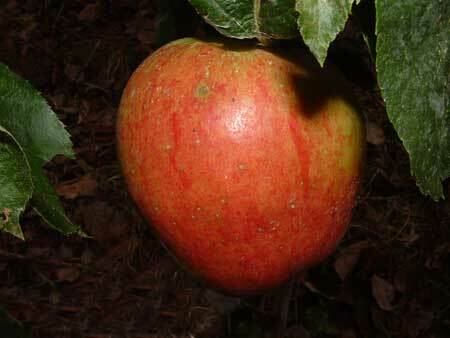 Image 'Braeburn' 19th October. DP. 1890. 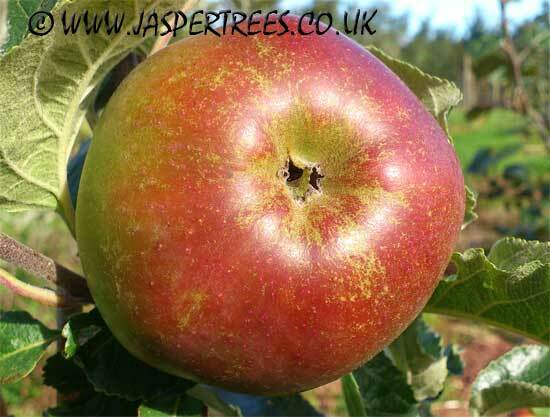 Peasgood Nonsuch x Cox's Orange Pippin. Use from October to December but best used early. Image 'Charles Ross' 6th September. AGM. M-LC. circa 1825. Raised in Slough by Richard Cox of Colnbrook Lawn. 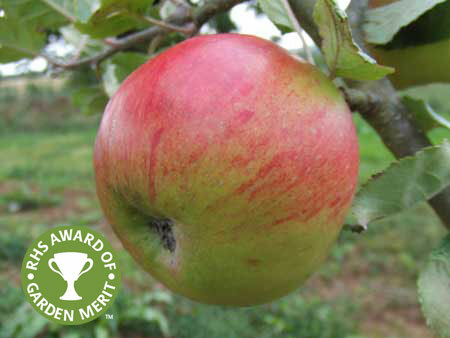 A fine delicate flavour when cooked, can also be used as a dessert. LD. Recorded 1613. Thought to be of Roman origin. 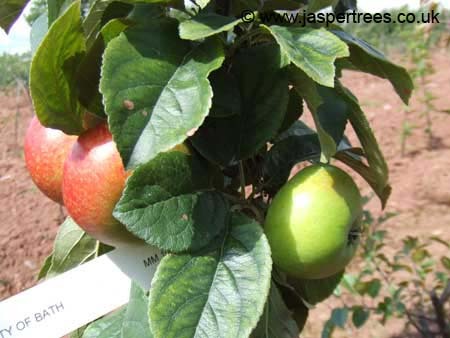 Late flowering, disease resistance. Small and hardy. Sweet with light aromatic flavour. Image 'Court Pendu Plat' 4th October. 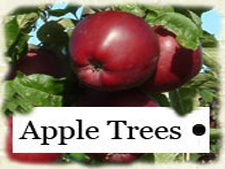 When you have decided what you would like, click on the 'order trees' link. This will take you to the Order Form page. It's an important decision I feel it's nice to browse without rushing your trees straight to a shopping cart! ED. One of the earliest along with George Cave.1949. Spur and tip bearer. 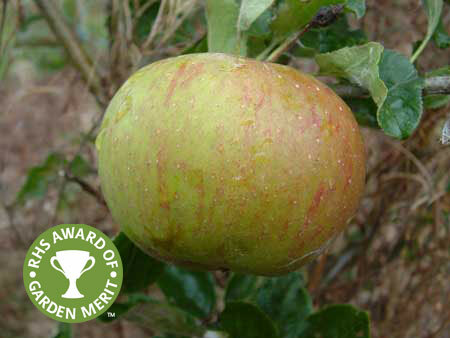 Firm and juicy with a pleasant flavour. Use August to September. Image 'Discovery' 18th August. AGM. MD. 1911. Intense rich, aromatic quality. Recommended. Use from September to October. Image 'Ellisons Orange' 15th September. AGM. EC. 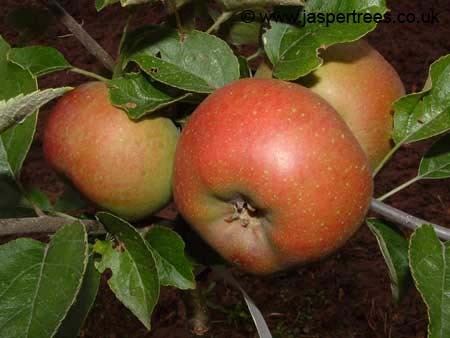 Keswick Codlin x Lord Grosvenor. Very early cooker ready in July to August. Prolific cropping, cooks to a puree. Image 'Emneth Early' 4th September. AGM. ED. 1904. Frost hardy. Small tree. Sweet and juicy. Use September to October. Image ' Laxtons Fortune' 11th September. AGM. MC Originated 1769. Yorkshire. 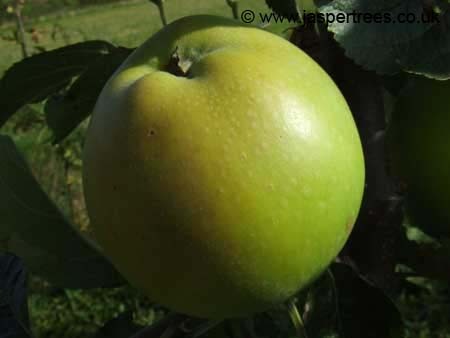 Sharp, well flavoured, less acidic than Bramleys Seedling. Prized Victorian and Edwardian cooker. Use October to December. Image 'Golden Noble' 18th August. EC. 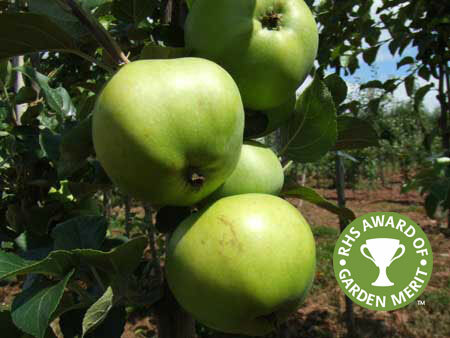 Heavy crops, Hardy variety with compact growth for small gardens and produces fruit spurs easily. August to October. Image 'Grenadier' 3rd August. AGM. Red flush on pale green. 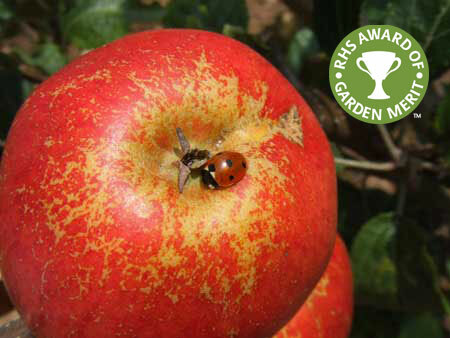 A great cooking variety with superb flavour. Red Charles Ross x Jonathan. Stores till March. 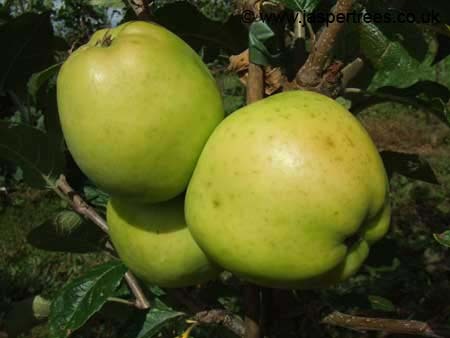 Large apples. A personal favourite. Image 'Jumbo' 10th October. A prolific second early culinary variety ready September to October. Spur bearing and hardy into north of the country. Image 'Keswick Codlin' 28th August. C. Similar angular shape to Catshead but more a more reliable variety. Cook early for a sharp taste. Use October to December. 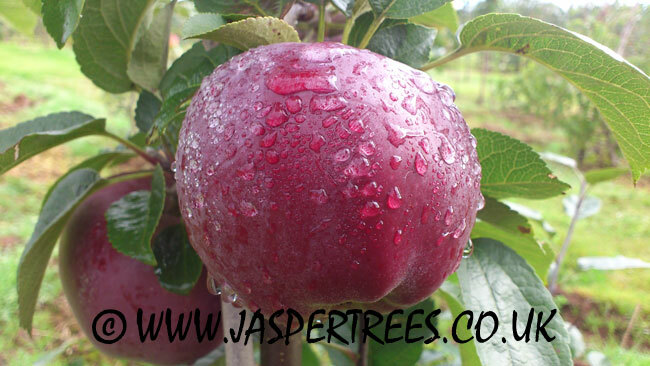 Very reliable and easy to grow. Image 'Lord Derby' 24th September. MD. Discovery x Greensleeves. 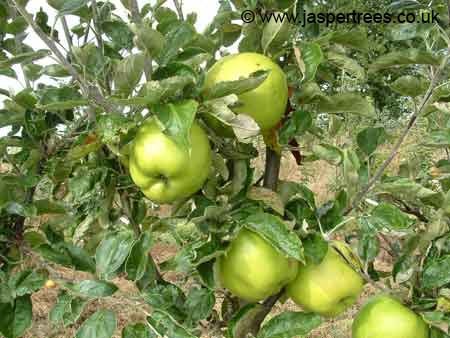 Like its parent Greensleeves is an abundant cropper. Use Sept to November.. Crisp taste and disease resistant. Image 'Limelight' 5th October. MD. 1907. 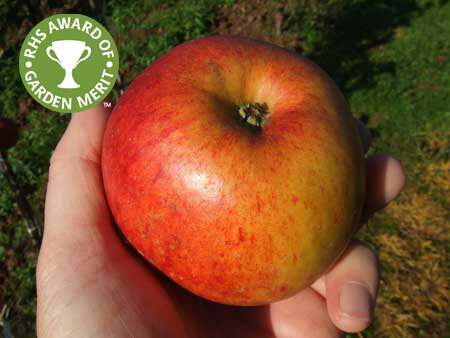 James Grieve x Worcester Pearmain. Juicy and sweet with a heavy red flush. Personal favourite, it succeeds anywhere. Use October to November. Image 'Lord Lambourne' 11th Sept. AGM. LC. abt1887. Large colourful late to very later cooker. Nov - March. Dumelows Seedling x Blenheim Orange. Hardy and suitable for the north. November to December. Image 'Newton Wonder' 2nd September. AGM. LD. 1776. One of the best late Desserts. 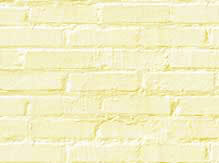 Golden yellow flushed with a dull orange red. Use November to January. Image 'Orleans Reinette' 25th September. LD. 1785 at Stoke Edith. 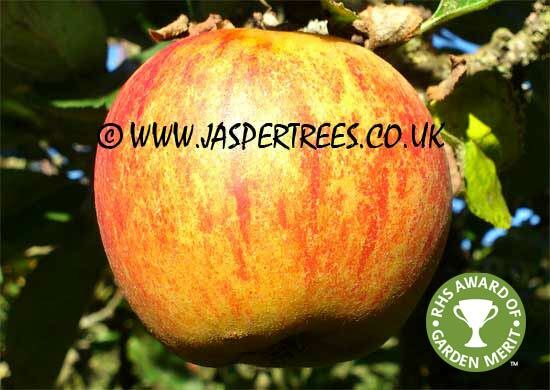 Can be an intensely flavoured apple, sharp, rich, honeyed, nutty and found by Hogg 'distinct pineapple'. Image 'Pitmaston Pineapple' 25th August. Dessert. Yellow with red stripes and an orange flush. 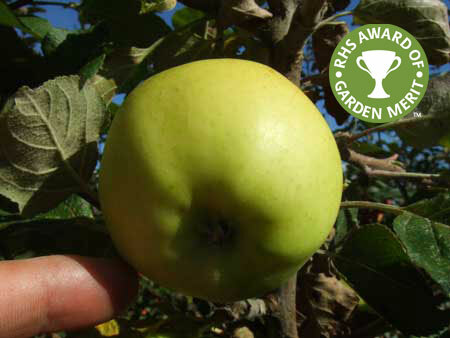 Reliable crops of finely flavoured small apples high in sugar content. Use December to March. Image 'Pixie' 24th September. AGM. LD. 1707. Originated Ribston Hall, Yorks. Conical yellow fruits flushed brownish orange. Use from October to January. 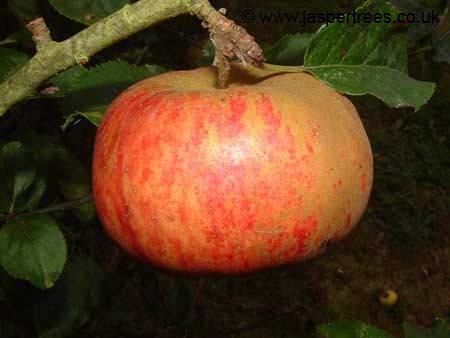 A parent of Cox's Orange Pippin. 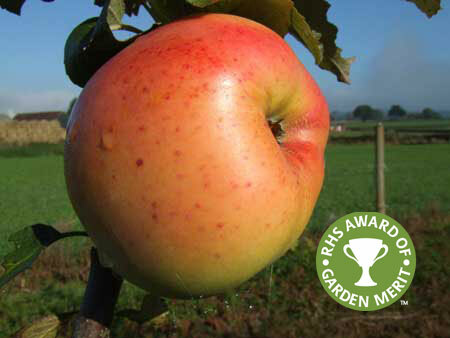 Image 'Ribston Pippin' 5th October. AGM. LD. 1926. 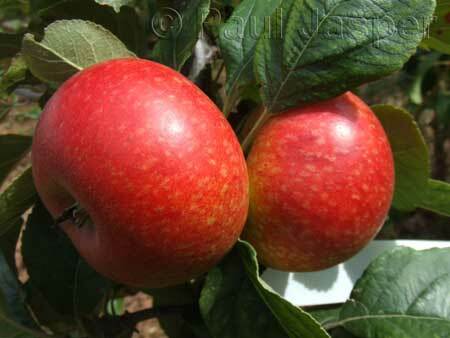 McIntosh Red x Yellow Newton Wonder. Popular. Crisp and juicy with a deep, purple flush. Use from October to January. Very prolific cropping. Image 'Spartan' 7th October. LD. 1872. Russet freckled over gold. 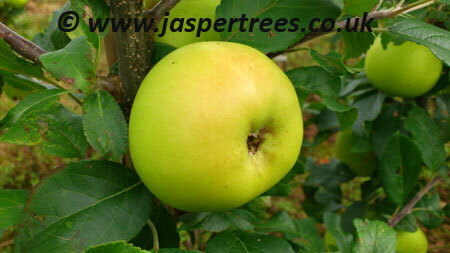 Sweet light slightly scented in November, easy to eat apple. Very late dessert for December to April. 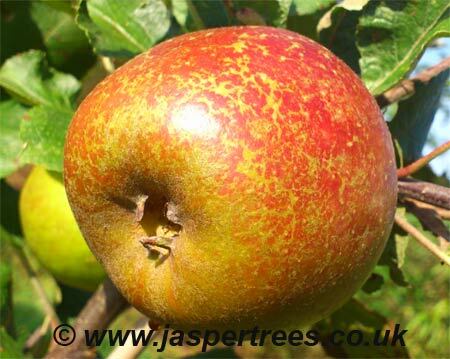 Laxtons Superb x Cox's Orange Pippin. Has the taste of Cox but better keeping qualities. Image 'Tydemans Late Orange' 15th August.